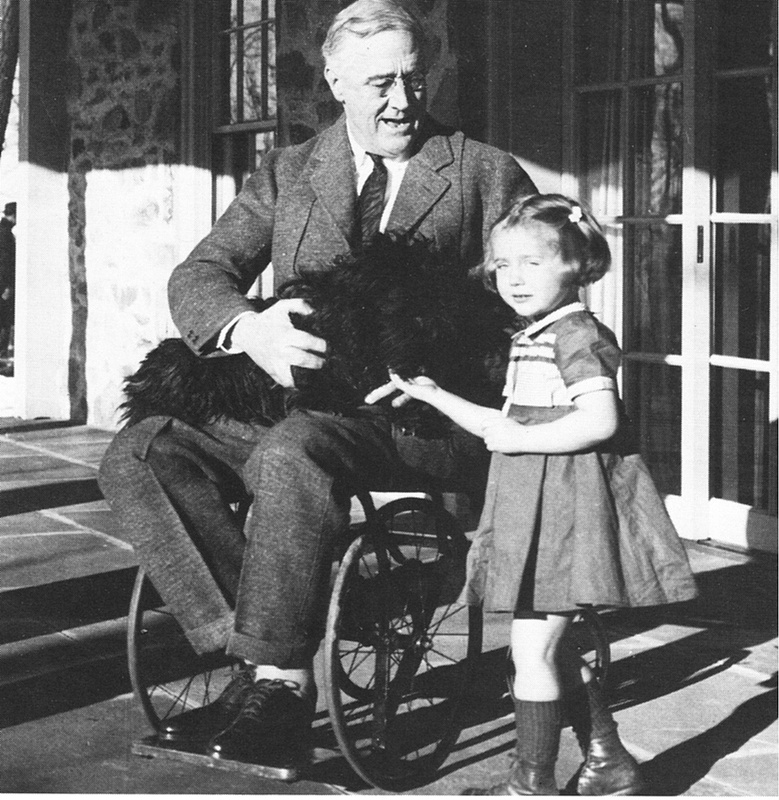 In talking with The Four-Year-Old about wheelchairs the other day, I happened to mention that Franklin D. Roosevelt had used a wheelchair, although he was notoriously shy about being seen in one. In fact, only three photos of FDR in a wheelchair exist. Why don’t we have more pictures of FDR in a wheelchair? Although the fact of his disability was known at the time, Roosevelt believed that it was essential for his political career to be viewed by the public as getting better. Consequently, despite being permanently paralyzed from the waist down from the time he was 39, Roosevelt trained himself to walk for short distances using iron braces on his legs and hips and a cane. He also arranged his public appearances so that he would appear to the public standing upright — supported discreetly by an aide, one of his sons, or an unusually solid lectern — while speaking. And he went to great lengths to conceal his arrival and departures, when the logistics of getting into and out of cars or up stairs made it impossible to hide his paralysis. He was helped in this by the news media, which treated his condition as taboo, and the Secret Service, who actively interfered with photographers who tried to take pictures of the President in his wheelchair. Why did FDR use a wheelchair? Of course, none of this really answers The Four-Year-Old’s original question, does it? At the time, FDR was thought to have suffered from paralytic poliomyelitis, contracted while on vacation in Canada. Polio was relatively common in the 1920s, and while few adults over 30 tended to contract the illness, the disease was on everyone’s mind. In fact, Roosevelt was placed under the care of two prominent polio specialists. More recently, specialists believe FDR may have actually suffered from Guillain-Barré syndrome (GBS), an illness in which the body’s immune system attacks the peripheral nervous system. Although his fever and subsequent permanent paralysis seem to support a diagnosis of polio, the course of the initial acute illness in which FDR experienced gradually increasing and ascending paralysis, bladder and bowel dysfunction, numbness and pain for about 2 weeks before regaining motion in all but his lower limbs, is a better match for GBS. But we’ll never know. A precise diagnosis would require sampling FDR’s spinal fluid, which is no longer available.